Being originally from the Atlantic City area and being born in 1975 this caught my attention today. Photos are of front and back covers. Cool to see all the local sponsors listed inside and area bike shops of the era. Neat piece of local history for me!
" J.P Ryffranck started building bikes in the 70s, part time. By the 1990s, it seemed every one on the local racing team had one of his bikes, including me. He left his job as a tool maker at 58 years old to pursue bike building full time, until 2011. He his 86 today and when I went to meet him (in early may 2016) he was working in his trusty old shed, tuning up a client's bike. He his a very interesting character and I tried to capture this in my interview with him. He talks about his beginnings, the templates he made during his many years of bike building and brazing among other things. I still own my Riffranck bike, which he made to my specifications 25 years ago, and I show it off a bit in the video. " In the video he mentions Bill Vetter who was a small builder in Vermont. We had a really nice Vetter touring bike here at the shop which sold a little while back. It is one of the only other times I have heard mention of Mr. Vetter. Enjoy the video! Thanks to Mr. Otsieguy for making and sharing it with me and the world! The seat stay caps on this bike are flat (see photos). 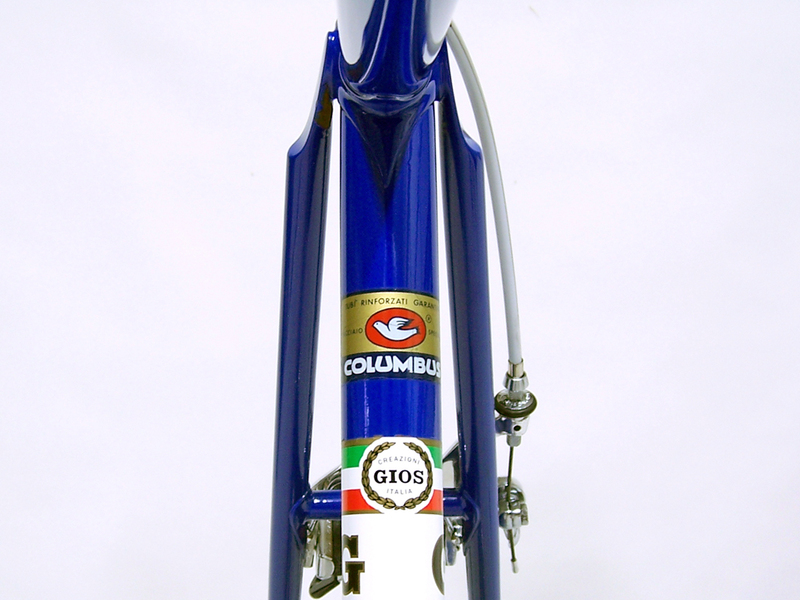 Also, Gios lugs do not have window cut outs like on this frame and the bottom bracket shells also have the Gios name cast into them with long cut out slots, this frame does not. All that being said, it is a still a nicely constructed bike! It has Campagnolo track drop outs and fork tips and the fork crown and rear bridge are NOT drilled for brakes. The fork is biult with nice beefy round blades and classic flat fork crown. there is a Columbus stamp on the steerer, so I assume the rest of the tubing is Columbus as well. The bottom bracket is English threaded as well as the steerer. It takes a 27.2 seat post size. There are two dents in the top tube, small one on the non drive side and a litlle bit larger one on the drive side, not bad about the size of a dime (see photos). The frame has a serial number of: Z5757935 stamped on the rear non drive side drop out. Not sure if this is original paint or not, I think not. Top tube measures 57CM CTC. Contact me at: bikeville@gmail.com with ant questions. Cost is $425.00 plus shipping. For Sale: Ross Apollo 5 speed muscle bike in great condition! Here is a blast from the past! Ross joined in on the muscle bike craze in the late 1960's and this was one of their models. The coolest ones had the top tube mount stick shifter, but this is still pretty cool. pretty much time capsule condition. Most everything looks to be original to the bike. I gave it a quick wipe down and put air in the tires and it is pretty much ready to go already. If you broke this down, overhauled it, shined it up and put it back together, WOW it will be awesome. Great summer time cruising project or hook up your kid with the bike you lusted after as a kid yourself! please check out the photos for reference. I am dating this bike to 1979 because of the rear brake cable housing. it has the 79 date stamp on it and looks to be original to the bike. Heck that piece of housing alone is valuable to OLD SCHOOL BMX collectors! Cost is $425.00 plus S/H. Contact me at: bikeville@gmail.com with any questions. We recently got this bike and I offer it for sale today. It is a Humber Special with a large size frame. It has the Humber cranks and fork. What is really cool about the bike is the steering dampener on the non-drive side of the headtube. See photo. Basically there is a band of metal inside the head tube which wraps around the steerer and when you tighten the lever it tightens around the fork steerer increasing resistance to steer the bike. I am not really sure of the application, maybe a security measure? the bike also has early Sturmey Archer hubs. The rear is stamped KB4 and has the cool early logo on the hub. Also of note is the fact that it is blacked out. Schwinn blacked out their parts during WWII. I am not aware of British manufacturers doing the same. Also this model dates to around 1932-33, well before WWII. Maybe it was just an aesthetic choice? Very cool. The rear hub also has a drum brake. The front is drum brake as well. The shifter is a K-Series (see photo) top tube mount. The serial number is K17994. It has original decals and paint as well as original gold striping. The seat tube measures 26" length and the stand over height is 36" (with air in the tires). Wheel size is 28". Please see photos for reference and email me at: bikeville@gmail.com with any questions. Local pick up is preferred as this bike will be expensive to ship because of size and weight.